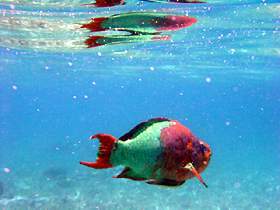 is a great variety of reef types and diving & snorkeling experiences in Belize. 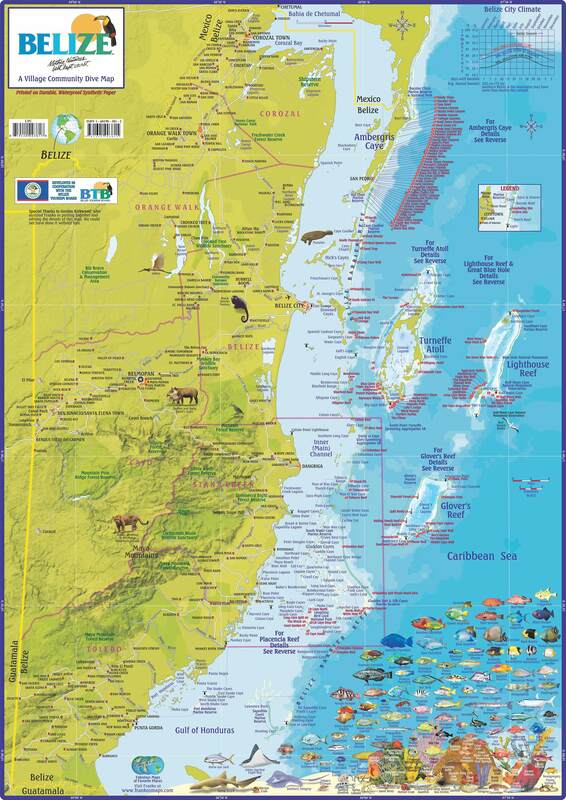 The Barrier Reef is 185 meandering miles (298 km) of unspoiled beauty. It varies from 8 to 16 miles (13-26 km) from the mainland to less than one mile (1.6 km) offshore from Ambergris Caye. Much of it is totally unexplored and all of it is easily accessible by boat. The reef is like a gigantic wall running parallel to the coast. Between the mainland and the reef are shallow, sandy waters with numerous mangrove-covered islands (cayes). 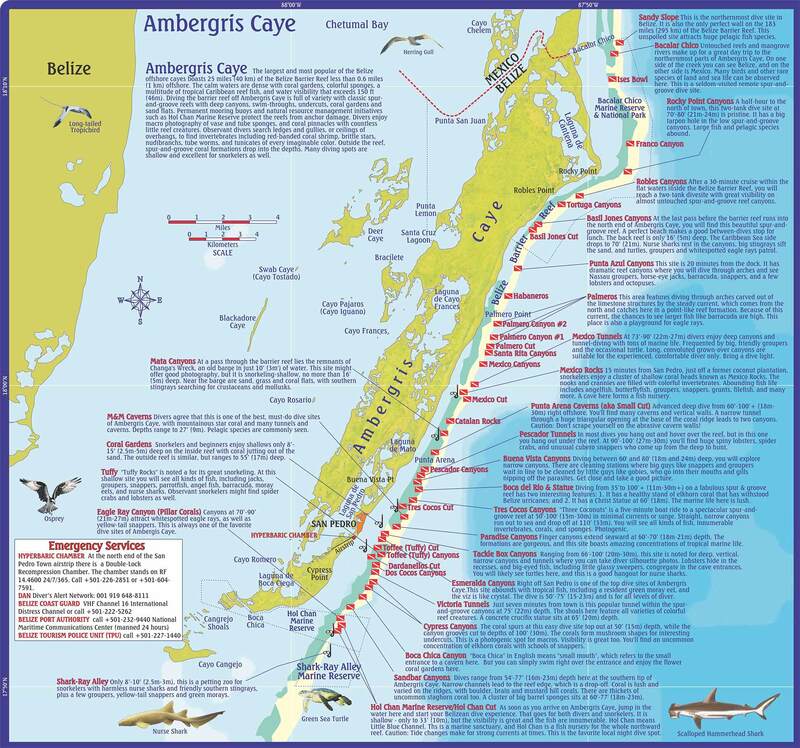 Click here for map of Ambergris Caye and Belize dive sites. 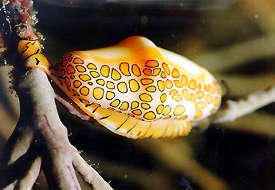 We also have an extensive selection of diving and snorkeling photographs. Elbert Greer, Scuba Lessons Belize Ltd.
Ambergris Caye is justly the most popular attraction to the tourists who come to Belize. The factor that most contributes to this is the unbelievably superb diving & snorkeling conditions. Accessibility to the dive sites, such as Lighthouse Reef, Turneffe Islands, as well as many excellent sites right off Ambergris Caye, combined with excellent weather conditions, clear warm water, the variety of dive sites and in the unlikely chance that a diving accident should occur, the hyperbaric chamber is minutes away from any of the dive sites. 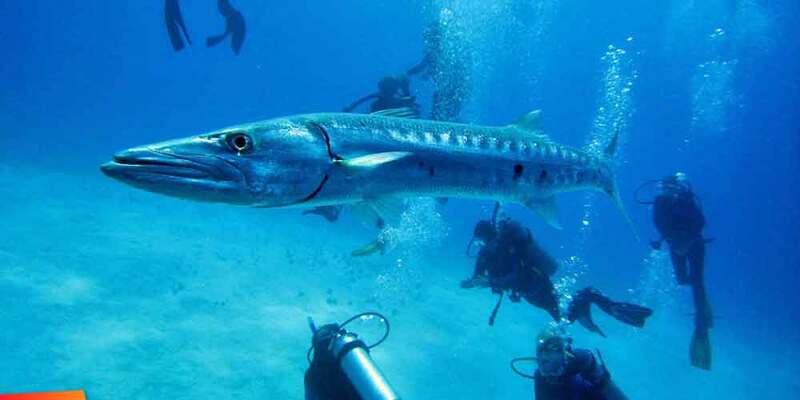 For general information on diving & snorkeling in Belize, click here. San Pedro Town is the site of major development which evolved from a laid back fishing village to an important tourist attraction. The pace is slow, the people are very friendly, the streets are still dirt and sand and the resorts are small and intimate. Click here for information showing the main points of the Outer Reef Lagoon, San Pedro and South, and the main cuts through the reef east of the island. Training is the basis of new regulation instituted by government this year to improve the services guides render to tourists. To become a dive guide in Belize, one first of all has to be Belizean, study to become a dive master, work with an experienced dive master for a considerable period of time, know the dive sites well, be versed in first aid and safety, and be of sound character. The San Pedro Tourist Guide Association which is 175 members strong plays a significant role in making sure that guides perform well, and guiding is safe. The basic San Pedro dive boat is an island built skiff in the 20 to 26 foot range powered by twin outboard motors. These are fairly fast, traveling to most dive sites within 15 to 20 minutes. 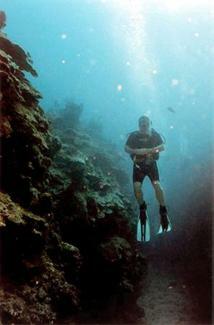 Dives are usually done one dive in the morning at 9:00 a.m. and another dive at 2:00 p.m. in the afternoon. The cost for these two dives, including tanks and weights, ranges around $75.00 U.S. for the two dives the same day. Dives are also arranged to suit diver's schedules. 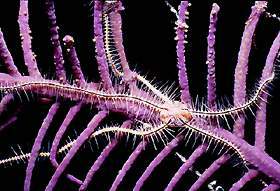 Night dives at the Hol Chan Marine Reserve are done regularly at a cost of about $65.00 U.S. 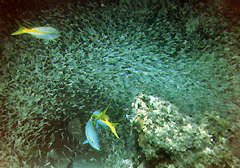 Most diving is done outside the reef at depths ranging from 40 to 100 feet. Marine life is more abundant in the Hol Chan Marine Reserve because it is protected and also because the tidal currents bring nutrients to the area which attract a variety of marine life. Skin Diver magazine describes a typical dive area off San Pedro as an area outside the reef where "the corals gradually slope to about 50 feet along a bottom of scattered heads, seafans, and gorgonians. From about 60 to 90 feet, the corals form immense spur and groove surge channels perpendicular to the shoreline. These high profile channels are adorned by yellow tube and azure vase sponges, large barrel sponges and a respectable amount of marine life. Rays and schooling jacks are frequently seen, and the most common reef tropicals such as groupers, coneys, angelfish and barracuda are almost sure to be seen. For a more interesting and convoluted bottom featuring caves full of copper sweepers and a resident school of horse-eyed jacks, the dive site Caverns, just outside the Mata Cut, is another local favorite." 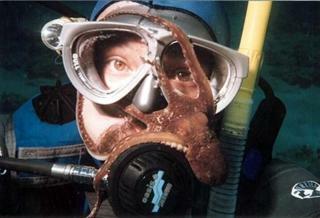 Several professionally run dive shops serve the divers with clean air and well kept diving and snorkeling equipment. Dive instructors work out of these dive shops providing full PADI and NAUl certifcation, referrals for divers wishing to complete the open water certification, and "discover diving" for the snorkelers who dare taste the exciting world of scuba diving. Scuba diving & snorkeling have come a long way in Ambergris Caye! Safety, protection of the natural resources and convenience to the diver are very important to our diving community. The government and people of Belize have decided that development of our tourist industry will be planned; it will grow slowly and gradually, never losing sight of the vital importance of protection of our precious reef and the dangers of over-development. But, please don't take my word for it, come check it out yourselves! For those interested in diving with Nitrox, the dive operators on Ambergris Caye that handle it are Ramons and the Caye Dive Resort. 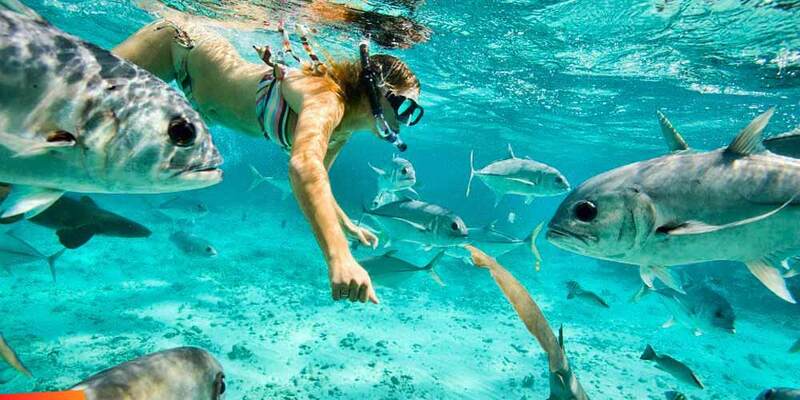 Ambergris Caye offers superb snorkeling. To enjoy it best you'll need to take a short boat trip out from shore. You can snorkel off the beach at your hotel or anywhere on the island, but you don't usually see as much. Some hotels work hard to keep their piers as appetizing to the fish as possible. It can be quite pleasant to float around and see what you can see off shore. The three most-popular areas for snorkeling from boats near Ambergris Caye are Hol Chan Marine Reserve, Shark-Sting Ray Alley and Mexico Rocks. 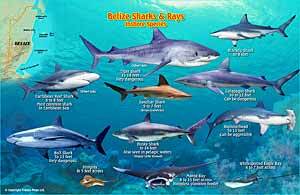 A visit to Hol Chan and Shark-Ray Alley to the south of San Pedro are usually combined into one trip, while Mexico Rocks to the north of town is usually a separate trip. Boat trips to either of these destinations cost around US$45 per adult, which usually includes snorkel mask and fin rental and a guide who will go into the water with you and point out the sights. Kids under about age 12 go for half price. There is an additional US$10.00 per-adult fee for admission to Hol Chan Reserve. The fee, which goes toward preservation of the Belize's parks, is collected at the reserve by rangers in power boats, so be sure to bring your money. These snorkeling trips usually last two to three hours. 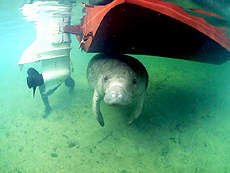 Typically, snorkel boats go out once in the morning and once in the afternoon, more frequently during busy periods. 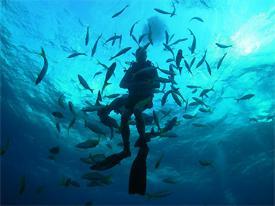 A couple of dozen dive and snorkel operators offer snorkel trips. It is difficult to recommend one over another, as the quality of the experience depends on who is your guide on a particular trip and also the weather and sea conditions. However, see the list of recommended dive shops at the top and bottom of this page. Note that boats cannot always go out, due to wind and weather conditions. When there's a strong wind or during "Northers" in the winter, snorkeling is unpleasant at best and could be dangerous. Night snorkeling trips also are available, at around US$65 per person. Night snorkelers may see lobster, eels, octopus and other creatures. ...so you see, not much variation. Depth doesn't matter much in open water, unlike in lakes that experience thermoclines. The sea is in a constant state of flux, so the temp at the surface is very close to that at 100'. A diversion from this is the Blue Hole, that does have thermoclines because of its topography and the lack of a current to turn the water over to even out the temp. The most common question after the general water temperature is what is the temp. in the Blue Hole at 130ft.....about 76f with hardly any change throughout the year at that depth. The Hol Chan Marine Reserve, about 4 miles south of San Pedro, is a 5-square-mile underwater national park established by the Belize government in 1987. Because fishing is prohibited in the reserve, there is a considerable amount of sea life. At the cut here, you may expect to see large groupers, nurse sharks, sting rays, moray and other eels, spadefish, schoolmasters and other fish. Much of the bottom is sandy, but you also will see bright coral. Depth is fairly shallow at between 5 to 30 feet. Visibility is usually good, at 50 to 60 feet or more, with late spring having the best water viz. Several snorkel boats may congregate at one time. In fact, it's a good idea to make a mental note of the name or identifying colors of your boat, so you don't swim back to the wrong boat. Do not touch the coral with your hands or fins, and do not feed or touch the fish. Caution! Tidal currents here can be quite strong. Weak swimmers or younger children may tire quickly swimming against the current. Ask your guide about the strength of the current at the time you are there, and let the guide know if you are not a good swimmer or have any disability. Don't be shy about accepting a life jacket. Shark- Ray Alley is a shallow cut to the south of Hol Chan where nurse sharks and sting rays congregate. Guides sometimes chum to attract the sharks, and you can jump in and swim with them. It's not half as scary as it sounds, and most of the people who come on the snorkel boats do get in the water here. At Mexico Rocks, off North Ambergris opposite a former coconut plantation, you may not see as many fish as at Hol Chan, but the coral is beautiful. Also, this area is protected from ocean swells and currents, so it makes for easier snorkeling. Depth is only about 6 to 12 feet, so you can see everything up close. Water viz is about the same as at Hol Chan, 50 feet or more. Catamarans and other vessels based in San Pedro visit some of Belize's other cayes and atolls, on longer trips for snorkeling and picnics. You typically pay around $195US plus a $40US park fee depending on the length of the trip, where you go and whether lunch and drinks are included. Turneffe doesn't allow for snorkeling, the Turneffe/Elbow trip isn't a trip that gets near snorkeling depths. San Pedro also has several glass-bottom boats which offer trips for around US$40. It's a long way to go for snorkeling, but Belize's atolls offer good snorkeling in shallow water around patch reefs. The reef life is extensive, and it is a fantastic snokeling experience. The diving& snorkeling immediately around Ambergris Caye is easily accessible. There is also some environmental degradation to the reef due to its use, although permanent mooring buoys at some sites have reduced anchor damage. Divers and snorkelers will enjoy the shallow dives and get to see a good variety of sea life and coral. Those willing to make a larger investment in time and money can use San Pedro as a base for day trips to distant cayes and atolls, which offer some of the best diving & snorkeling in all of the Caribbean. Diving around the atolls is mostly wall diving, while diving around Ambergris is spur-and-groove with some deep canyons, swim throughs and reef cuts. Heavy wave action from Hurricane Mitch did only limited damage to dive sites around Ambergris Caye. 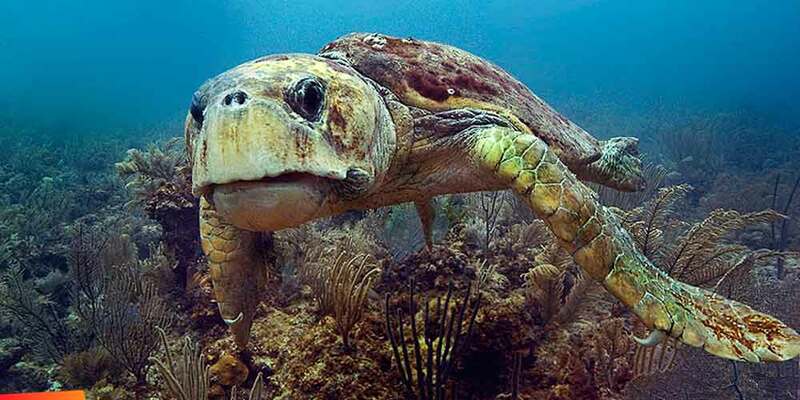 It destroyed some fragile coral, such as elk horn and seafans, especially near the water surface, and caused temporary loss of pigmentation in hard coral, but it scoured out green algae and cleaned out sand. 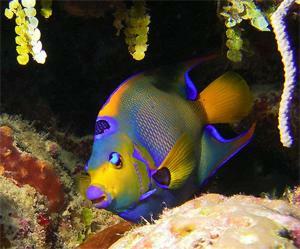 One of the good things about Ambergris Caye, in the eyes of many, is that it does not cater only to divers. Indeed, the majority of visitors to the island now are not divers, and this means that those who don't dive will not feel they are just extra baggage on a dive machine. Ambergris Caye offers a good mix of dive and non-dive activities. Those who wish to do nothing but dive, eat, sleep, and dive may be better off choosing a dive lodge on one of the remote atolls or a live-aboard dive boat. Two-tank dives around Ambergris Caye typically go for about US$75. One-tank dives are about US$20 less; three-tank dives about US$20 more. Rates usually include tanks, weights and belts. Other equipment is extra; US$30 is about average for a full set of gear. If you want underwater adventure without the hassle of becoming a certified diver; then SNUBA is for you! SNUBA diving is the safest and easiest way possible to experience the fascination of Scuba diving with the simplicity of snorkeling. 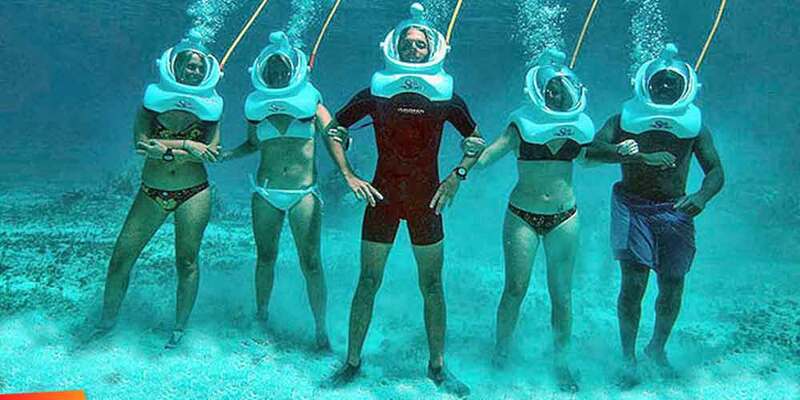 You can SNUBA down to 20 feet with no prior experience. Explore clear tropical waters with pristine coral reefs and incredible sea life paired with the most knowledgeable SNUBA guides in the world! Just bring your bathing suit and grab that underwater camera! Depart aboard a boat for a scenic cruise to one of our SNUBA locations. While underway, your professional SNUBA guide will provide a briefing on the safe use of SNUBA. Your tour is fully guided for your safety and entertainment. 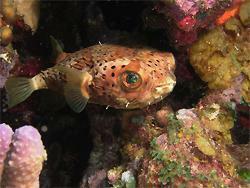 Those looking for even better diving likely will consider diving one of Belize's atolls. These are Pacific-style atolls with coral islands surrounding a fairly shallow lagoon. Only four true atolls exist in the Western Hemisphere; three of them are off Belize. 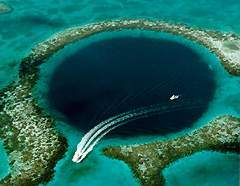 Belize's three atolls are Turneffe Islands, Lighthouse Reef, and Glover's. Turneffe and Lighthouse are closest to Ambergris Caye and are practical day trips. 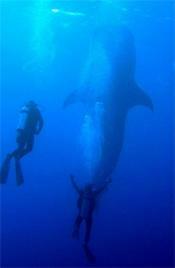 A new marine reserve around the Silk Cayes and Galdden entrance opened recently with whale sharks a major attraction. Click here for more information on whale sharks. For detailed information on the reserve, click here. 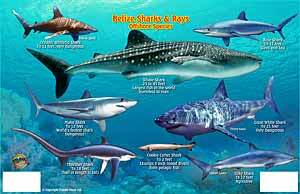 Belize Dive/Fish ID Cards of the sharks and coral reef creatures of Belize. 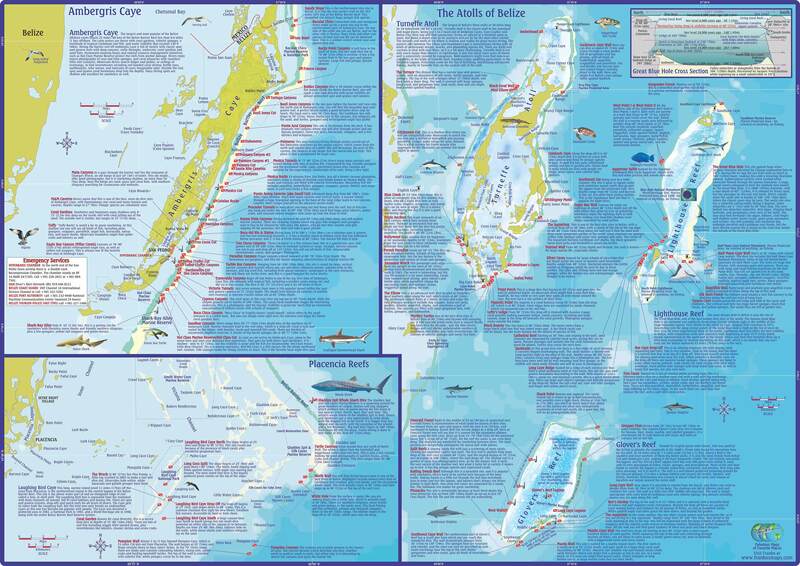 Click images for larger versions, or CLICK HERE for all of them on one page along with dive maps. For the more-serious diver, there is variety enough here to make for many weeks of diving. Visibility is terrific, often 150 feet or more. 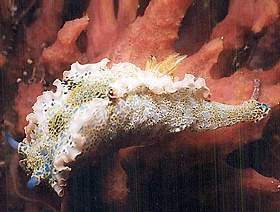 While many of the sites are best for intermediate and advanced divers, some are suitable for novice divers. From San Pedro, expect to pay about US$225 to US$275 for a day trip to Lighthouse or Turneffe, depending on the number of dives. Lunch is usually included. A typical trip to Lighthouse takes one and a half hours or a little longer each way, includes three dives, lunch and snacks and costs about US$300 per person. Note that sometimes dive trips are canceled if not enough divers sign up for a specific trip. The Turneffe Islands are about 20 miles east of Belize City. This is the largest atoll and the closest to the mainland. It differs somewhat from the other two atolls in that most of the islands here are densely covered in mangroves, especially on the west side. 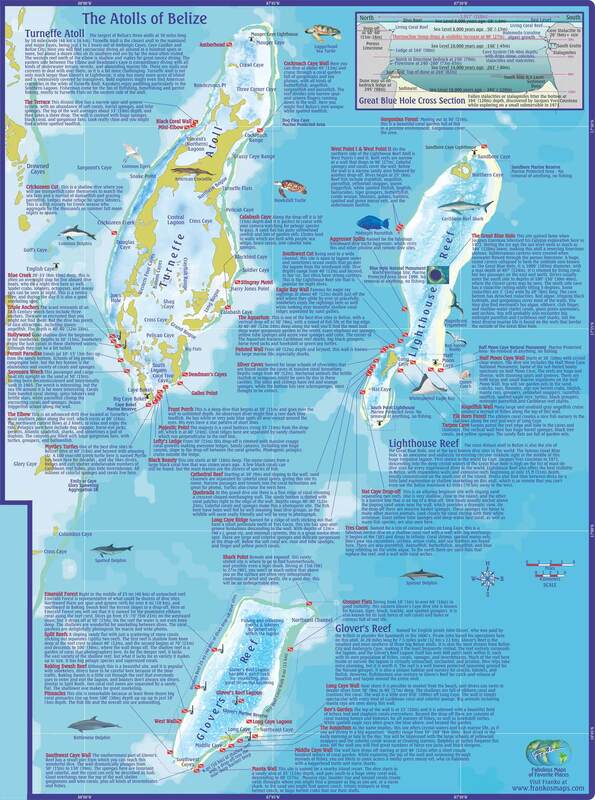 Black Beauty, Myrtle's Turtle and Mauger Caye (north of the atoll, with a lighthouse) are among the popular dive sites here. Mauger is known for its sharks. Lighthouse Reef is about 60 miles east of Belize City. Lighthouse is home to Half Moon Caye Natural Monument, comprising about 15 square miles of atoll plus another 15 square miles of surrounding waters. Protected as a marine reserve since 1981, Lighthouse teems with birds, including a nesting colony of rare red-footed boobies. Under water life is also rich here, with dolphins and other creatures. At Lighthouse also is the Blue Hole, a limestone sinkhole several hundred feet across and more than 400 feet deep, made famous by Jacques Cousteau. Divers usually report that while the Blue Hole is worth doing once, it is more spectacular when seen from the air then from underwater. Glover's Reef is about 30 miles east of Dangriga. The perimeter of the atoll has elk horn coral forests. 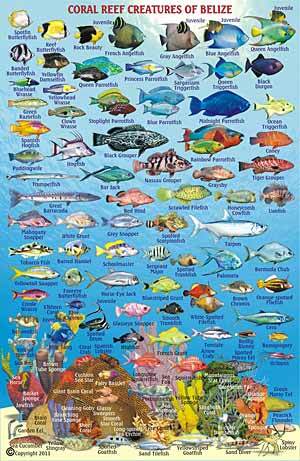 Here and in a deeper sandy area is a great variety of fish and sea life, including many sharks. Shark Point, northeast of North Caye with its lighthouse, is well-known for hammerhead and tiger sharks. San Pedro has the country's only hyperbaric chamber. It's located near the airstrip. Most dive shops ask for a small donation with each tank fill which goes toward funding the chamber. For those who don't dive but would like to, several Ambergris Caye dive shops offer courses and training. A resort course costs about US$165. This includes classroom training, practice in a pool or in the water, and an actual dive, usually at Hol Chan. Complete open water certification runs around US$475 and requires three to four days. For those who have completed classroom instruction elsewhere, the two-day open water training is about US$330. I would rate the safety of dive shops in San Pedro as much higher than dive shops in, say, Florida, where dive shops are afraid to put divemasters in the water with their diving & snorkeling guests. The reason? If a dive shop elects to properly supervise diving activities in Florida, and there is an accident, even a minor one, then the diver can sue the tar out of the dive shop and divemaster. It is actually better for a Florida dive shop to have 5 unsupervised diving deaths a year than have 1 minor supervised diving accident (where, say, a diver has to go to a dive chamber for a few hours treatment, full recovery, and sues dive shop for 50million for "pain and suffering caused"). In Florida, it is standard practice for a dive boat to leave port with 20-45 divers, one captain and one non-diving divemaster. Here in San Pedro we would never dream of such a terrible mis-match of divers to divemasters, and our dives are ALWAYS in-water supervised by qualified divemasters. Dive shops here are not afraid to tell a guest that the chamber is needed treatment if that guest is feeling funny after diving. The great thing about chamber treatment is that it's fairly routine....the crime is letting mild symptoms get worse by not admitting one of your divers to the chamber because of the potential for getting a bad reputation. Every serious dive shop on Ambergris Caye has an excellent safety record, and no dive shop can or should claim to have the "best safety record" on the island. Belize is not -- and never will be -- a big chartering center as, for example, is the British Virgin Islands. For one thing, stiff winds, strong currents and the barrier reef with its hidden coral heads can make navigation dicey, even for sailors who know local waters. Still, a few bareboat and crewed charters are available in Belize. To the right are a few of those who handle charters. For more on boating in Belize and around the island, click here. Cats, motorboats and sailboats temporarily in Belize may be available for charter from time to time. These boats come and go at the whim of the seas and their captains. Ask locally in San Pedro (especially at the Belize Yacht Club) or at the marinas at the Radisson Fort George or Fiesta Inn in Belize City or on Moho Caye. Catamarans for day or short charters may be available at Ramon's and Journey's End and elsewhere. Liveaboard dive boats are also an option for those seeking the salt. We get a lot of questions here about jellyfish, so I thought I'd mention that the jellyfish season is during the trade winds of March - June. However we do not get many jellyfish and this would be a snorkeler's or diver's least concern. Your chances of getting a serious sting would be 1:5000 or more. A buddy has been diving here for 15 years and never had a serious sting! We have no 'deadly' jellyfish in the Caribbean - such as the box jellyfish. By the end of november there are practically no stinging critters in the water due to the change of seasons and drop in water temperature. Coral scratches are self inflicted. a dive skin is a good thing to wear year around. a wetsuit is only necessary during the cold fronts in the winter months. Note: The offshore reef and its protecting of the inland sea around the island makes for extremely clear and calm water for diving & snorkeling. Most of the area inside the reef is 6-8 feet deep, and you can see more here with just a mask and/or snorkle than you can see most places while diving. In that mere 6-10 feet deep of water, there is an amazing diversity of marine life. Dolphins (very friendly), nurse sharks, rays, zillions of multi-colored fish of many varieties highlight a quick dip in the water around Ambergris Caye. Any novice can come here and be amazed, and then go to the dive shops and become an expert! As a child said, "Its like Seaworld without the glass..."
My father was of the opinion that we would become more worldly through travel than through material things and he gave us the chance to swim with the Manatees, view our first shark in the water and through a mask, and experience Belize's reefs and cayes long before it became hip. Back then we were back-a-bush island people. I did not appreciate his wisdom then, the peer pressure being what it was. Now, I do. Big time! Words cannot express the feeling of euphoria one experiences when cruising the reef area, gazing at the wonderment of the crystal clear waters surrounding the islands and its inhabitants. I have had a chance to swim with dolphins, float with schools of Eagle Rays, and toy with lobsters, a part of my life I will never forget. I have also gazed into the eyes of humongous barracudas, chased behind sharks, fed the "puppy" sharks that come up to the shore to be fed on the outer-most islands. I have never ever felt truly peaceful as when I'm cruising Belize's reefs and am immersed in its waters. We are truly blessed! I recently got certified as a Divemaster, and so it was with keen anticipation that I embarked on Monday,May 25th on my first guiding job to the Blue Hole. The evening before, Karl Pariente, the chief divemaster on board, and I, loaded Frenchie's Diving luxury liner, the Ocean Pro with with thirty tanks. We would have eight divers on board plus Karl and I. 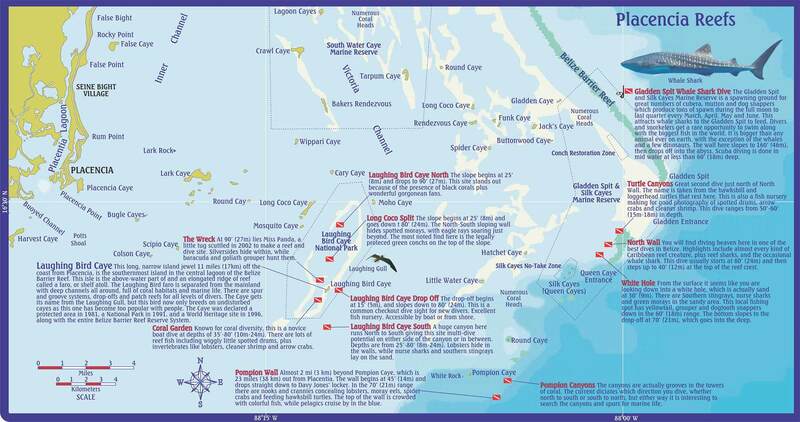 And we would be doing three dives each - one at the Blue Hole, one at Half Moon Caye and one at Long Caye. At 5:30 a.m., I awoke, got dressed and headed out to Frenchie's. Daylight was just breaking and I was delighted to see people on the streets, even at that early hour. We fitted up the divers with their gear and at 6:00 a.m. headed out to sea. While passing through the Caye Caulker split, Karl slowed the boat enough to introduce himself and me, and welcome the divers on board. We passed through the channel into the deep blue waters about five minutes later. The journey to the Blue Hole would last about two hours. Fortunately for us, it was an unusually calm day and the journey started well. Half way to the Blue Hole we would pass through the Turneffe Atolls and near the Turneffe Islands. This was always a welcome passage for me as the crossing from the Caye Caulker channel to near Turneffe can weather the best of the sea men (or women). This phenomenon lasted for the better part of half an hour, with the dolphins jumping, dancing, cruising,flipping and just putting on the most absolutely outstanding acrobatic show I have ever seen. If I had not seen it myself I probably would not have believed it was possible...it was so incredible!!! We looked on with obvious delight and marvelled at how beautiful these creatures are. I even wondered out loud what would happen if I jumped in the water where they were. Wouldn't it be an absolutely incredible experience to swim with a dolphin - in the wild? After a delay of half an hour or so, Karl increased the throttle on the boat and we continued into the Turneffe Atoll and out again on the other side, only to be greeted once again by another pod of dolphins, only not as large as the previous group!!! At this point, I was inclined to believe that this was a migration of some sort. I have never, ever, ever seen so many dolphins all in one place at the same time. Oh, my, what a pleasurable experience! We continued on to the Blue Hole, and after maneuvering through the coral patches, entered the Blue Hole. There was another boat there, already moored, and getting its divers ready to descend. We suited up in our SCUBA gear. Karl gave his dive briefing. (He is so good at his job). We would descend to 130' and stay there for 8 minutes, and the ascent would be to thirty feet for fifteen minutes, then the three minute safety stop at 15'. Divers were asked to face the wall so as not to drift into the middle of the Hole, and we would dive as a group. We were still assigned buddies. Karl would lead the dive and I would follow in the rear to help the divers having trouble, if any. The signal to descend was given and down we went. Unfortunately for me, two of the divers had trouble equalizing. They were both fairly new divers, having dove less than five times each, and so the effort to bring them down would be greater than usual. I was inclined to believe that the problem was more anxiety than an inability to equalize. I successfully brought the first diver, a female, to the 130' foot level and she melted into the crowd. The other diver, a male, could not equalize and so I coasted over along with him at the 70' level. We just barely made it to where the cave in started. Had he made it down probably 15' more, he would have been able to enjoy the stalagmites and stalagtites which are the attraction on this dive. Not to mention the eerieness of being in a black hole (yes, they call it blue, but from inside, it's black) coasting along knowing full well there is a school of Lemon sharks, a bull shark and a hammerhead shark that share the same small space with you. Yu done get me all excited bou di dolfin dem an di blue hole, gal. A cant wait fu yer bou di ress a di storie. Nex time a git down de yu cud kerr mi da di blu hole.